James Paxton struck out 12 over eight innings while allowing just two hits as the New York Yankees blew out the Red Sox 8-0. Despite the fact that he struck out 12 and allowed zero runs, he actually had to fight back to a lot of batters. He only had first pitch strikes to half of the 28 batters he faced. So he was getting outs after going down 1-0 or 2-0, which is incredibly impressive. And, he only threw 110 pitches, which isn’t a lot for how many strikeouts he had and for how many counts he was behind in. Paxton also got eight fly-ball outs and four ground-outs. Outside of the two hits, Paxton also hit a batter to allow just three total base-runners. The Yankee defense was also fantastic, led by a play from Giovanny Urshela. With Mookie Betts up, he grounded a ball down the third base line. Urshela backhanded, and threw to first while slipping and falling down to get Betts. The Yankees offense finally kicked it into gear to beat up Chris Sale and is Red Sox. In the third, DJ LeMahieu and Luke Voit each had RBI singles to start it off. An inning later, Clint Frazier belted a high change-up into the seats for a lead-off home run, and Mike Tauchman scored Austin Romine on a double. Romine impressed everyone with his base-running, while Tauchman advanced to third on the throw home. It was the sixth inning the next time Tauchman was up, and belted a long three-run home run for the first one of his career. This made it 7-0 good guys. The Yankees put up one final insurance run in the seventh when Gleyber Torres hit one for his fourth of the season. With the large lead, the Yankees put in Joe Harvey to finish it off in the ninth after Paxton’s night was complete. He worked a scoreless inning, despite allowing a hit. The second and final game of the series will take place on Wednesday at 6:30PM on ESPN, YES, and Fox Sports Go. 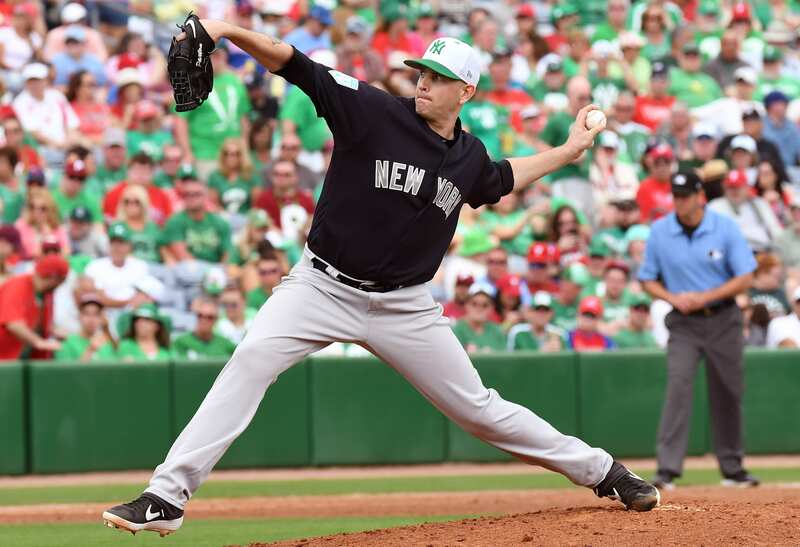 JA Happ gets the ball for the Yankees against ex-Yankee Nathan Eovaldi for the Sox.